These Coin Sorting Trays are a real time saver when you need to quickly count all your change. Just pour and shake, and these stack-able Coin Counting Trays will do the rest. 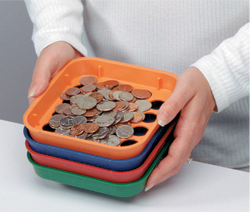 Compact, color-coded, interlocking trays prevent spilling or sorted coins and will sort pennies through quarters. Use our Coin Counting Trays for fast and accurate coin sorting. Feel free to browse our other Money handling Supplies including Coin Sorters, and our Coin Wrappers.